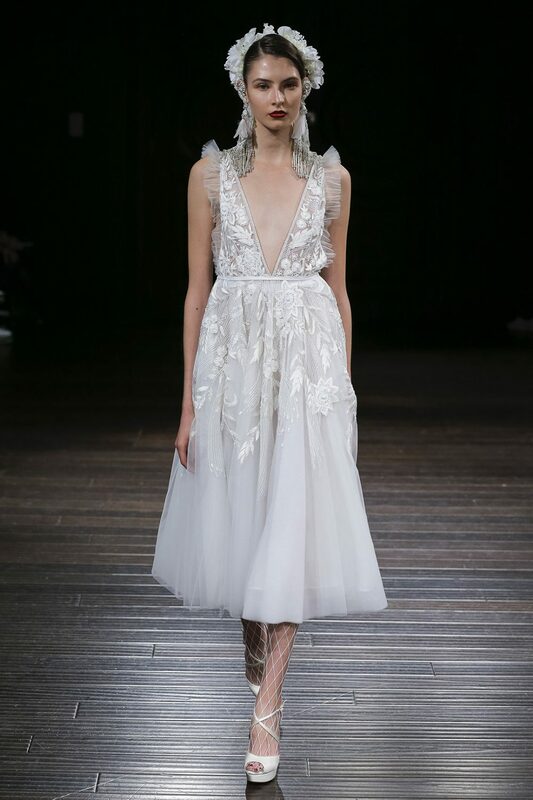 New York Bridal Fashion Week has wrapped, and we are swooning over the romantic and feminine looks that graced this years’ runway! When choosing a gown for a destination wedding, several factors come into play. Will the ceremony be outdoors? On a beach? In a garden? What’s your personal style? What will work best for the conditions at your ceremony site? Having planned and designed so many Chic Bahamas Weddings, we can assure you that we have seen it all. That’s why we’ve rounded up our favorite gowns from Bridal Fashion Week for a Bahamas wedding. We’re going to show you our favorite looks in categories ranging from Short and Sweet to Sultry. And all of these gowns will work well for an outdoor and/or beach wedding! We’ll start with Short and Sweet – a great option for brides who choose to marry in the summer months when the temperatures peak. We have chosen five dresses with hemlines ranging from mini to tea length. And styles for everyone, whether you’re into minimalism or all-out glam. Which style is your fave? If you need help finding your dream dress, we are happy to assist and recommend the very best bridal salons, stylists, and seamstresses. Contact us for more information.